Have you noticed? Everyone is so ready and eager to give you "well meaning" advice - regardless whether they know what they're talking about or not. I've consciously surrounded myself with like minded people so I absolutely trust what they've to say when I share my problems, my friends would always have great advice and solutions for me. That being said, I'm still not obligated to listen to what they have to say. I need to listen to what my heart is telling me. Recently my friend who introduced this great coach who helps people break their income ceiling and many of his clients are making $20k - $175k per month. Am I excited about the number? Of course I am! I'll be lying to you if I said I wasn't excited by the numbers. Specifically, my ego was super excited but my heart wasn't. Life has taught me that if I didn't listen to what my heart is saying, the journey would be treacherous. I did give the coach a chance though. He was saying all the right things but still I wasn't drawn to the energy of his so called process and system. I promised myself that I'll never sell my soul for money and that I'll operate out of my heart space doing only what makes me happy. So I told my friend that his "system" wasn't lighting me up and I'll still follow my guidance. So... the #1 thing you need to do to design a life you love is to stop following the crowd and not allow anyone to tell you what you should do with your life. It's time to crave out time to be alone with yourself to figure YOU out. Just because you are you, it doesn't mean you know you - if it make sense. If you ask yourself deeper questions, what you may find out is that all your desires may not be yours in the first place. Perhaps you're going to law school because MUM didn't get a change to go to Law school and you're fulfilling HER dreams. The ugly truth is only 1 out of 5 people know what they really want. Take your time to get to know who you are. You're in no rush or competition to get there! There's no there if you don't know how to live in the now. I wish you well and it's time to become the woman you've always wanted to be! 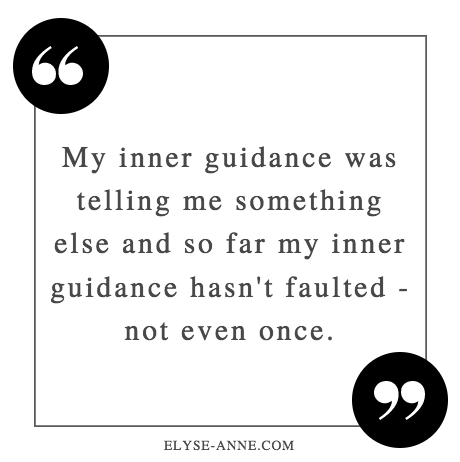 © Elyse-Anne.com 2017 | Your trusted spiritual business coach and social media strategist for Spiritual Entrepreneurs. I help you Get Your Greatest Work Out to the World, Make You Influential & Get Paid Being You! | I'm a visionary and I look at the big picture so please excuse any grammar mistakes if there's any. This is such an incredible asset, to the point that you are giving and you give it away for nothing.